Naples has long enjoyed a reputation as Italy's most musical city. But the Puglia region, and particularly the southernmost part, Salento, now challenges the Campanian capital's dominance. Puglia boasts a rich and diverse musical culture that encompasses everything from folk forms like the now world-famous pizzica to alternative rock to hip-hop. Regional governor Nichi Vendola's leftist administration has prioritized culture, creating funding streams and structures to support musicians, the latter including Puglia Sounds, an agency that subsidizes recording, performing, and touring expenses of local musical acts. One of the bands that has benefited from the regional government's farsightedness is Canzoniere Grecanico Salentino, aka CGS, the marvelous pizzica ensemble that has become a leading attraction on the world music scene. The band's concerts and recordings have earned them dream reviews from critics and their fan base has steadily expanded with each tour. (CGS leader Mauro Durante even has likened their rigorous performing schedule to Bob Dylan's so-called never-ending tour.) But Puglia Sounds has put its euros (and promotional muscle) behind a few other acts that inhabit the same musical universe as CGS – pizzica and related folk styles, performed in a contemporary key that honors tradition but isn't confined by it. The Milan-based Ponderosa label, in collaboration with Puglia Sounds, has released three new albums that display the creative vitality of the contemporary scene. Two are by native Puglia artists – the singer and percussionist Antonio Castrignanò and the band Kalàscima – one by a northern Italian convert, the pianist and composer Ludovico Einaudi. The Torino-based Einaudi, in fact, is the connective tissue among the three recordings. He has twice conducted the orchestra at the annual La Notte della Taranta festival in Salento, whose players have included Castrignanò and Kalàscima's founder and lead percussionist Riccardo Laganà, as well as Mauro Durante and other CGS members. Einaudi is a guest on Kalàscima's Psychedelic Trance Tarantella and Castrignanò appears on Einaudi's Taranta Project. Listening to the three albums is like hanging out with a club of singers and players who come together in different configurations while sharing a common repertoire. Which is not to say that they or their recordings sound the same. 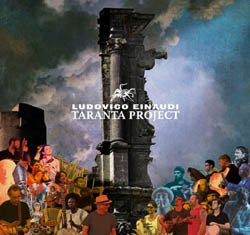 Ludovico Einaudi's Taranta Project draws on material that he and the La Notte della Taranta orchestra performed at the 2010 and 2011 editions of the Salento festival. Though mostly pizzica-based, the album also touches on Middle Eastern and African styles, as well as Baroque. Einaudi, who bears a striking resemblance to the comedian Larry David, is a classical pianist and composer, and that background is evident in the track that opens Taranta Project, "Introductio ad regnum Tarantulae" (Introduction to the Tarantula's Kingdom). Besides members of CGS, including Mauro Durante, credited as Einaudi's "musical assistant," and other leading Salentine musicians, Einaudi has recruited a number of non-Italian players who have performed at La Notte. They include Turkish multi-instrumentalist and composer Mercan Dede, Malian kora virtuoso Ballaké Sissoko, and two members of Robert Plant's Sensational Shape Shifters, Juldeh Camara, from Gambia, and English guitarist Justin Adams. Adams esteems pizzica as a style that can "go from intimate to epic." Taranta Project aims mostly for the epic, for big, dramatic effects, and it mostly works. So do the guests' contributions. On "Nazzu Nazzu," Camara's one-string fiddle solo and vocals take the music from Salento to Africa smoothly, avoiding any unsettling turbulence from genre-hopping. Something similar happens on the medley "Tonio Yima/Riollala." Adams kicks it off, Juldeh Camara comes in on vocal and fiddle, and then CGS' Emanuele Licci brings it back to Salento. But throughout the album, it's the Salentine stalwarts who most impress, whether it's Durante's violin soloing on "Choros" or Castrignanò singing "Core meu" to an arrangement that blends pizzica and psychedelia, or CGS's great, gruff-voiced Giancarlo Paglialunga delivering a plaintive "Ferma Zitella" backed by Sissoko's kora and Einaudi's piano. 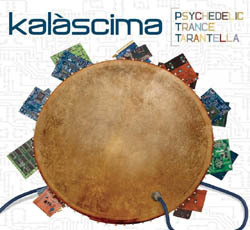 Kalàscima's Psychedelic Trance Tarantella lives up to its title; although the song structures mainly hew to traditional pizzica, the electronic effects and production touches add a lysergic sheen. The record opens with the title track, a mostly instrumental piece whose one-verse lyric announces that this band makes 21st century pizzica that eschews mysticism, mythology, and nostalgia for the rural past. In Salentine folklore, dancing the pizzica healed the ills, physical and emotional, supposedly caused by poisonous tarantula bites. Kalàscima assert that the world that gave rise to tarantismo is gone: "Where did the poisonous tarantula bite you?/ It did not bite you, the poisonous tarantula/There is no taranta anymore." The next track, "This Way," continues that theme; as the two percussionists, Riccardo and Federico Laganà, beat their frame drums, the band sings, "The tarantula is gone, it's gone, it has hidden, the poisonous tarantula." The arrangement's mix of rustic tradition – reedy harmonica, jew's harp, acoustic guitar – and contemporaneity – electronic percussion, processed vocals, synthesizers – sounds fresh and arresting. That's true of the album, at its best. At times, the "trippiness" comes across as forced and even heavy-handed. But for the most part, Kalàscima achieves their declared aim of connecting "ancient roots and modern technology." 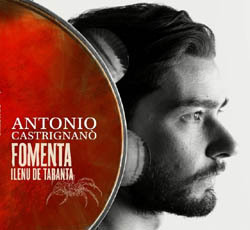 For this reviewer, Antonio Castrignanò's Fomenta: ilenu de Taranta is the most satisfying of the three albums. Like Psychedelic Trance Tarantella, its approach to Salentine music is of the moment, in the arrangements and instrumentation (electronic effects and synths, electric bass) while remaining faithful to the roots. And like Taranta Project at its best, the performances can be intimate and epic. An accomplished percussionist and powerful singer, Castrignanò also has composed film scores. Like his excellent debut album Mara La Fatia, his new record has a cinematic quality; its nine tracks are like a soundtrack for a gripping drama about not only contemporary Salento but also the connections between its music and other Mediterranean cultural currents. Produced by Mercan Dede, Fomenta: ilenu de Taranta has pizzica at its core but Turkey, North Africa, the Middle East, and the Balkans also are in the mix. The opening track, "Core meu" (My Heart), is the same song Castrignanò performs on Taranta Project. But what a difference. It begins as straight pizzica, Castrignanò's fierce vocal and insistent tamburello beats dominant and then travels to the Balkans on Cafer Nazlibas' kemane (a type of Macedonian violin) solo. Castrignano then leaps in, singing and beating a tamburello, while the Turkish Rom percussionist Mert Elmas on darbuka adds another layer of rhythm to the Salentine foundation. It's a brilliant reinvention of a traditional number. "Funtana Gitana" may be familiar to fans of the Salento electro-pizzica band Nidi d'Arc, who recorded it as "L'acqua de la funtana" for their album St. Rocco's Rave. Their version is closer to Jamaican dub, echo-ey and ethereal, while Castrignanò's is a high-energy Balkan-ized take on the song – the title translates as "Gypsy Fountain" – with oompah-ing tuba, kemane, and accordion. "Sciamune" (Let's Go"), an instrumental, with CGS' Giulio Bianco guesting on zampogne (southern Italian bagpipes), is full-throttle pizzica; it surges, decelerates, and then surges again to its breakneck finale. The late master Antonio "Uccio" Aloisi, I assume, inspired "Pizzica di Uccio" (Uccio's Pizzica). Castrignanò has adapted it "to time and space to survive," adding electronically altered voices and Nazlibas's kamane soaring over the swelling rhythms. Castrignanò was smart to add Nazlibas, from Turkey, to his ensemble; his contributions here, on "Core meu," "Lu Culuri te la Terra" (The Colors of the Land), and elsewhere are integral to the album's based-in-pizzica but pan-Mediterranean aesthetic. The penultimate track, "La Ciuccia Nera" (The Black Donkey) is reminiscent of "Signora Madama," from Mara La Fatia. That number, a mini-movie in song, was a satiric tale about a woman who leaves her peasant roots behind when she marries a rich man, returning to her village once a year to take part in a local festival. "La Ciuccia Nera" (The Black Donkey) takes its inspiration from Fellini's abortive 1943 film set in Libya, "I Cavalieri del Deserto/Gli ultimi Tuareg (The Knights of the Desert/The last Tuaregs). In the screenplay, an Italian soldier is left behind in Libya and there falls in love with the titular animal. Castrignanò, playing the solider, sings, "Everybody in the piazza parties when I ride on the black donkey." © 2015 RootsWorld. No reproduction of any part of this page or its associated files is permitted without express written permission.